I read this short, powerful novel in three sittings over a day and a half, reluctant to finish it but compelled to compelled to follow the story and characters to the end. Michael and his older brother Francis live with their mother in the Park, a public housing complex in Scarborough, Toronto. Their mother is an immigrant from Trinidad. Life for teenage boys like Michael and Francis is rough and tumble, filled with possibilities of disastrous life-changing–or life-ending–encounters with police and local toughs. Their mother works as many jobs as she can, traveling long hours on buses, to bring home enough money to feed and clothe her sons. The story is told from the point of view of Michael, the younger brother. We know from the beginning, which is set in a later time, that Francis eventually disappears, so every scene in which Francis does appear is weighted with that knowledge. The brothers are close, but different; Francis, it’s clear, can teach his younger brother some life skills but he’s destined to go his own way. After a violent incident in the housing complex, life becomes more tense and the arc of the story accelerates. Not all the scenes are filled with violence: there are several wonderful scenes between Michael and a teenage girl, Aisha, and also in a barbershop. Character, pacing, and atmosphere all combine in a powerful and heartbreaking tale. Even if you think you’ve read too many books about the lives of immigrants in violent communities, read Brother. It joins the rank of other standout books and short stories about that important sibling relationship because Chariandy get the psychology right. The Weight of Ink, or where’s the writer? In the July 15th New York Times Book Review, in a review of Alexander Chee’s book How to Write an Autobiographical Novel, J.W. McCormack writes: “In Chee’s telling, the writer’s life always lurks just beyond the page…” I’m always interested in the writer lurking just out of reach and the relationship of the book to the writer’s life. I don’t mean that I expect incidents to reflect personal experience or characters to be modeled on friends and family. There’s a much more subtle relationship that I’m interested in. For the past 18 months I’ve been on the reading committee for the new Jewish Fiction Award given by the Association of Jewish Libraries; the winner announced this past spring was Rachel Kadish’s novel The Weight of Ink. The book is set in London in the 1660s and today, an example of what I call a “split-screen” novel. In the historical plotline, Ester Velazquez is a young woman working as a scribe for an eminent blind rabbi. Women were never scribes; it’s an endeavor hedged about with strictures and tradition, closed to Jewish women who, in any case, usually didn’t receive much education. In the modern part of the story, the rabbi’s papers are discovered hidden in an old house and a Cambridge scholar is hired to examine this unusual treasure trove. The reader knows that Ester is the scribe; that knowledge dawns on the Cambridge scholar and her assistant only slowly. From hints and clues they piece together Ester’s remarkable life. The reader always knows more about Ester and the ending is bittersweet as we realize that her life will never be fully known by the researchers. I’ve heard Kadish speak several times about the genesis of the novel. Her comments made the connection–for me–between the writer’s life and the story she tells. Before she knew what the story would be and where it would be set, Kadish thought about the women whose pens and voices were mostly silent through the centuries. What if a Jewish woman had had a chance to write and make her voice heard on paper and explore her philosophical interests in correspondence with the great philosophical minds of her day? How could it transpire that a woman have that opportunity? What would her life look like? So the title, with its nod to the transgressive nature of Ester’s life, is quite appropriate. Ester and the rabbi carry the weight of their arrangement, the secret that sets her apart from her contemporaries and from the London Jewish community. It’s a great story with compelling characters in both plotlines. Kadish’s interest in telling such a story is the personal connection, the writer lurking beyond the pages. I believe that every novelist sets out to solve a problem and the novel is the result. Not a problem in the sense of something needing to be fixed, but an artistic challenge, an effort to represent ideas on paper in a way that rings true. The nature of that challenge comes from the writer’s life: the mixture of lived experiences and concerns lurking behind the creative process that drives the resulting story. At the end of May I spent 2 wonderful days at the Javits Center in New York for the publishing trade show, Book Expo. If you’re unfamiliar with this annual book extravaganza, hundreds of publishers set up booths to promote their Fall titles and meet with booksellers from around the country. Advance copies of the titles that the publishers want to promote are given away, authors sign their books, and there’s lots of swag to be had. After 20 years of attending, I have a large collection of publisher-themed canvas tote bags. It’s a standing joke among friends and family. Over the 2 days, I lugged home about 25 books–books that have already garnered good reviews and the latest books from my favorite authors. And of course, I’m certain, as I am every year, that I’ll read them all—even though I still have lots of unread books from years past! No surprise that I first chose to read Transcription by Kate Atkinson, one of my favorite authors. Atkinson combines literary writing with warmth and humor in compelling ways. This novel, to be published in September, centers around a young woman, Juliet Armstrong, who is recruited to spy for MI5 just before WWII. Britain in the late 1930s was dealing with fifth columnists: homegrown fascists, communists, and Nazis. Juliet goes from transcribing taped conversations to much more dangerous work, by turns tedious and terrifying. An orphan, Juliet has a great deal to learn about the world, but she’s more than willing to try the undercover life she’s been offered. What she doesn’t understand is that the choices she makes in those war years will follow her into later life. Nothing is ever finished and there are surprises for the reader at the end. Atkinson’s writing is always a treat to read; Juliet and the supporting cast of characters are lively and well-drawn. The London wartime setting is very evocative. If you enjoy Ian McEwan’s or A.S. Byatt’s novels you will probably enjoy Transcription, too. Her previous two novels–Life After Life and A God in Ruins–were among her best; Transcription is lighter, maybe more accessible to readers who were put off by the structural complexity of the earlier two. I’ve read every one of Atkinson’s novels and loved them all. If you haven’t read any of her books, start with the first, Behind the Scenes at the Museum and you’ll be hooked. I was in the gym last week riding a stationary bicycle called an Expresso, which has a video screen and movable handlebars. It allows you to pick a scenic ride and steer around curves, change gears, etc. It’s something to distract you from the boring activity you’re engaged in. A way to trick the mind and body. Last week I was also reading William Maxwell’s novel, first published in 1980, So Long, See You Tomorrow. Maxwell was the fiction editor at the New Yorker for many years and he’s a writer’s writer, a peerless prose stylist, whose writing is clarity itself and seems to have sprung forth effortlessly from a swiftly moving pen. You think about how easy he makes it look, how you could do that too! Well, probably not. But it did make me think about how the good writer is always right there with us when we read. So let’s say that when you read a novel, you’re getting on the bicycle that the writer has constructed. You think you’re in control: you set the speed you’ll read at, turn the pages, stay on course, and you expect that when you’re done you’ve done something good for your brain. Then you realize that the author has climbed up right behind you. In So Long, See You Tomorrow, Maxwell sets out to tell a story that has a simple plot. A teenage boy recounts how the father of a friend murdered his next door neighbor. The setting is a small town in Illinois. (I’m not giving anything away; this is how the book begins.) Maxwell goes back and forth in time so we see cause and effect. A pretty straightforward ride, yes? The first jolt is when we hear the name of the son of the murderer: Cletus Smith. Maxwell writes that it’s not his real name. Wham, he’s shaking the bicycle seat. Why, in a novel, is he telling us this? Are we riding through memoir territory? What other surprises are on the road ahead? From that point on, Maxwell is looking over our shoulder, nudging us to turn left here, right there, varying the pacing. Like changes in the landscape, there are changes in point of view. Even the family dog weighs in. It all serves to deepen our engagement with the characters and the plot. We find ourselves thinking about issues of memory, friendship, and the human condition. We’re in his hands, getting a good workout. I loved this family story, a first novel that’s full of life and characters that live beyond the page. It starts off slowly, building the reader’s relationship with the Amendola family, especially Gail, the Irish girl from Brooklyn’s Bay Ridge neighborhood, who married into an Italian Staten Island family and learned to live with the rules of the culture she adopted, for better or worse. The novel takes place over the course of one week, but with a generous use of flashbacks we learn all about the Amendolas, what they think and feel. Wife Gail and her retired firefighter husband Michael had 3 sons, but the youngest, Robert, also a firefighter, was killed on 9/11. It’s now 10 years later, but the family is still reeling from the loss as they prepare for the birthday celebration of their grandson Bobby, Jr., this small son of their own youngest son, who has never known his father. I always hope that the first pages of a novel will tell me something wonderful about what to expect in the way of the writing. 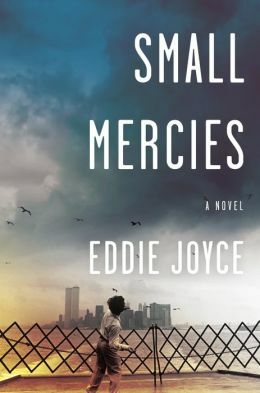 Each chapter in Small Mercies is told from the point of view of a family member, and on the second page, in a chapter told from Gail’s perspective, I found the nugget that let me know that I was in the hands of a great storyteller. Gail’s on her way out: “A quick look in the mirror. Not for vanity, not anymore, but for its older sister: dignity.” Brilliant. Joyce has something to say and says it well. The Amendolas are part of a close-knit culture of Italians and Irish in Staten Island; what one character calls “the servants’ quarters of the city.” They share the neighborhood rituals and enthusiasms: liquor and sports anchor this community. There is some chafing at expectations: oldest son Peter couldn’t wait to get out and as a teenager rode the ferry to Manhattan to remind himself of where he wanted to be. But even as a successful lawyer, with a WASP wife, he’s unable to shake the feeling he’ll never fit in. Middle son Franky never recovered from the death of his younger brother and turned to alcohol to anesthetize his grief. Bobby’s widow, Tina, still tied closely to the Amendolas, wonders if 10 years is long enough to be a single mother as she starts to date. Gail and Michael have their own issues to work out and there’s reference to the ways they pleased and disappointed their own parents. Joyce brings us into the thoughts of these characters and some terrific minor folks as well. He clearly loves them all. I enjoyed the structure, which allows him to introduce depth and reveal backstory. Each chapter is told from the point of view of a single character, but these alternate with Gail’s chapters, always coming back to her experiences and point of view. As the reader moves through the novel, hearing each characters’ thoughts, the characters become more rounded, more alive, and the story becomes more emotional and revealing. It’s an example of how domestic fiction, in the hands of a good writer, can be completely absorbing. The title refers to the setting of this novel in the northernmost part of Norway, in the summer, where two unlikely Americans meet at a Viking Museum. I need to back up to set the scene for this unusual, affecting story. Francis, a young artist, has just broken up with her boyfriend, who tells her that painting is of no use to the world: “What you do doesn’t help anybody.” Other parts of Francis’s life are broken: her parents are divorcing and her younger sister Sarah is getting married to a man that her parents dislike. Everyone is unhappy. Francis has the opportunity for an internship in Lofoten, a group of islands 95 miles north of the Arctic circle and it seems like the right time to get away. She’ll be working on something called the Yellow Project. Yasha, a young man of 17, lives with his father in Brighton Beach where they own a bakery. Their lives are broken, too. Yasha and his father Vassily immigrated from Russia 10 years ago, but Yasha’s mother never followed them and refuses to communicate with them. They both miss her terribly and after Yasha’s high school graduation they decide to return to Russia to find her. Vassily suffers a heart attack in Russia and Yasha, according to his father’s wishes, takes his body to–you guessed it–Lofoten, to bury him as he wished. In the time Yasha spends in Lofoten, he finds much more than he ever imagined–he grows up, for one thing. The joy of reading this unusual novel is in Dinerstein’s writing, which is circular, elliptical, and utterly captivating. She manages to convey the way we think and converse–the serious and mundane things that crash about simultaneously in our heads; the emotions we can’t or won’t convey; and the feelings of loss and loneliness that we all share. The setting and supporting characters are delineated in a few quick strokes, but their voices are unique.